These maple glazed vegetables are a twist on traditional British honey glazed veg. The extra pecan topping adds a real American twist to this simple side dish. Get the recipe below. As we race through autumn, ever closer to Thanksgiving and Christmas, my thoughts turn to entertaining. This time of year we love have friends and family over at the weekend for a big roast dinner. Roasted meats, creamy dauphinoise potatoes, cauliflower cheese and of course tonnes of vegetables all smothered in gravy have to be the ultimate comfort food. 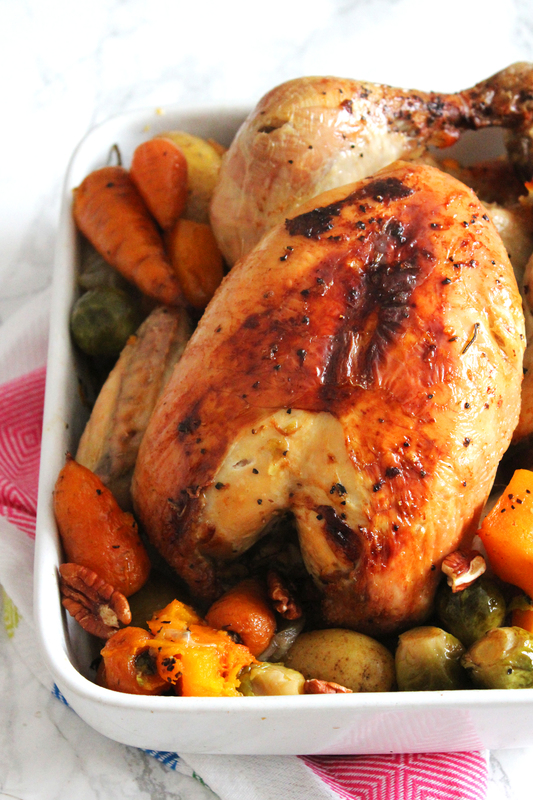 A big roast dinner is like getting a hug from your Nan! Don’t you think? If your friends and family are anything like mine then the least popular dishes on the table are always the veggies. Whether you’ve got a brussel sprouts hater in your midst or someone who detests carrots (Jon I’m looking at you) you might find that the roast potatoes or Yorkshire puddings disappear faster than the healthier side dishes on the table. By putting a bit of an American spin on things, I’ve tried jazzing up the usual vegetables I’d serve in a bid to convince people they’re not all that bland! Glazing vegetables while roasting them in the oven is hardly a new concept and honey glazed parsnips and carrots have been served up at Christmas for years. As I was pulling together menu ideas for our annual Thanksgiving dinner (apologies for the cultural appropriate in advance…) I wanted to put a twist on this classic dish. With a big bottle of maple syrup already in the cupboard, half used from the time I made this epic Apple, Pecan and Bourbon Pie, I knew it would be a great swap for honey. Like honey, maple syrup can have a wide variety of different flavours which are affected by the tree from which the syrup is taken. Apparently, the Agriculture Canada has developed a “flavour wheel” that details the 91 unique flavours that can be present in maple syrup. These flavours are divided into 13 families including vanilla, burnt, fruity, floral and spicy amongst others… who knew it was so sophisticated?! Whilst the maple syrup you decide to buy may not taste quite the same as the one I’ve used there’s one thing that all maple syrups have in common. They are sweet. With this in mind, my recipe uses garlic and fresh herbs to balance out the sweet and savoury elements of the dish. Shallots, carrots, brussels and more! What I really love about this dish is that you can pretty much chuck in any veggie you fancy. 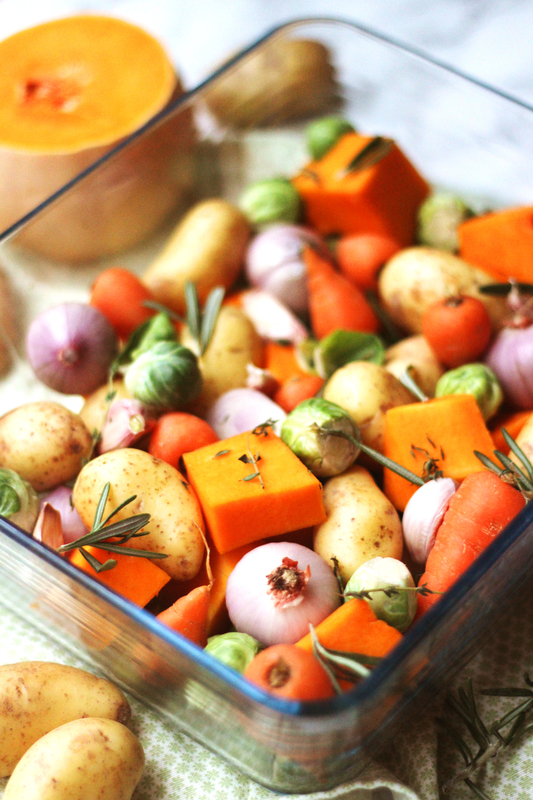 Root vegetables stand up to roasting better than more delicate greens like brussel sprouts but with a bit of care and attention they can all be roasted together in the same pan saving space and reducing the amount of washing up left at the end of the dinner. My favourite combination of veggies to glaze are: butternut squash, potatoes, parsnips, carrots, shallots, and brussel sprouts. For the more delicate vegetables like small shallots and brussels, roast them with the other veggies and simply pull off the outside layers/skin once they are roasted. This not only protects them from burning but saves you prep time too! I will also like to include a whole head of garlic, cut in half, skin still on to roast alongside the vegetables. This will become soft, sticky and much more mellow as it roasts and tastes great smeared across your meat or potatoes! Fresh rosemary and thyme added towards the end of the roasting process add another layer of savoury flavour and aroma. One of the best bits about roasted vegetables are the crunchy, crispy bits where the edges of the vegetables have caramelized as they’ve been pushed up against the scorching hot sides of your oven dish. Because not everyone can have veggies from the corner of the dish, I decided to top my maple glazed vegetables with crumbled pecans. I add these towards the end of roasting so that they don’t burn. Instead they are toasted releasing their aromatic oils and they get that little bit more crunchy. A really satisfying texture against the soft roasted vegetables and meat. But enough talking…I’ve made myself hungry just by writing this post! Note to self…don’t start blogging immediately before lunch. You’ll be hungry in no time. 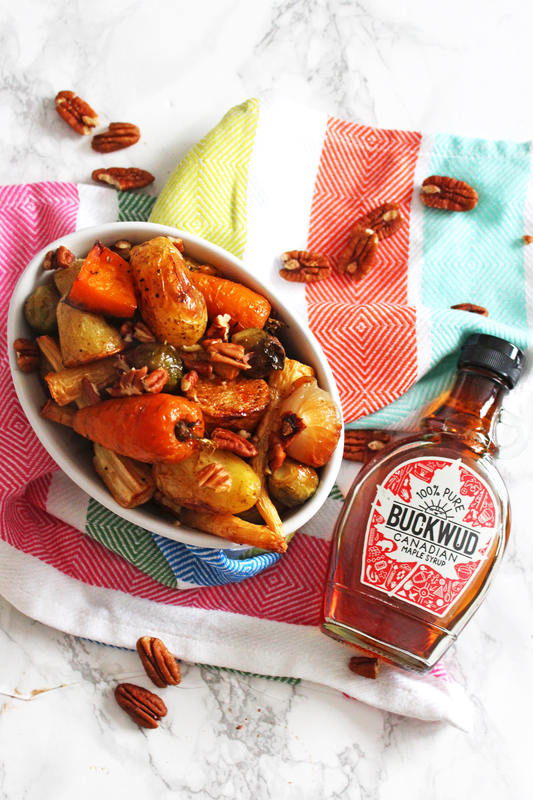 Check out my simple recipe for Maple Glazed Vegetables with Pecan Crunch below. Begin by prepping the vegetables: cut any large potatoes in half and leave any small ones whole; peel the butternut squash and cut into large chunks, roughly the same size as the potato; top and tail the parsnips and cut in half, the rest of the vegetables can stay as they are. Place the vegetables into a large roasting dish with a drizzle of oil and season liberally. Give the roasting dish a good shake to ensure all of the vegetables are covered. Dot the garlic cloves around the roasting dish and scatter with the herbs. Roast in the oven for 1 hour, giving the oven dish a shake every 20 minutes or so to ensure the vegetables don't stick to the side. In the last 10 minutes of cooking, drizzle over the maple syrup and scatter over the crumbled pecans. Roast until the nuts are toasted and the vegetables glazed. Before serving peel off the skins from the garlic, shallots and brussel sprouts. Whether you’re making these Maple Roasted Vegetables for a special dinner such as Christmas or Thanksgiving, you’re going to need a joint of meat to go with it! Why not try one of these recipes below. God, I love smothering roast veg in maple syrup – also very good with a drizzle of balsamic as well! Great suggestion Laura. I’m a big balsamic fan too but never tried it on roasted veggies! Thanks Kristen. I always say that colourful food is the best food for you! I think that I just found my “new” side dish for Thanksgiving! Thank you!!! Who would have thought that there were 91 unique flavours in maple syrup – but I suppose that it probably is a complex as wine, coffee or chocolate, so maybe it is not that surprising. I love roast vegetables and will be adding some maple to the next batch. I know right Helen! I’m not sure my palette is sophisticated enough to spot all 91! 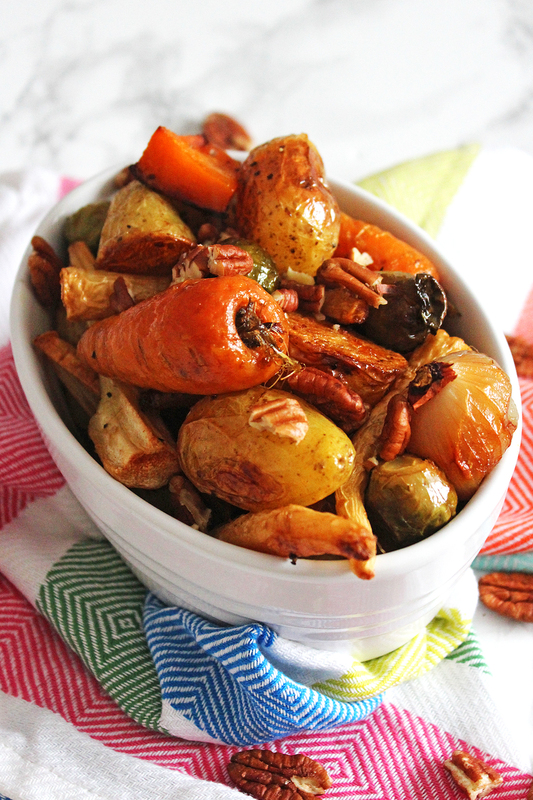 I LOVE adding maple syrup when I roast vegetables, it gives such a lovely taste and crunch! And I love how you added pecans. I just can’t have maple syrup without pecans 😛 match made in heaven right? This looks like a gorgeous addition to any Thanksgiving table! I’ll definitely be giving these a try! Love maple syrup and now I’ll have to add some when I next make a tray of roasted veg. In fact we might have to have this tonight now!! Oh my god Emma, that is borderline genius! I can just imagine how good it smells and taste too! Thanks Janie! I must admit I don’t know why I hadn’t tried it sooner. I think I’m in love! What an incredible vegetable recipe, so many delicious flavours and you had me hooked at maple syrup and I was totally lost by the time we reached pecans. Thinking of adding this to my Christmas table as a gift to myself! Glad you like it Janice 😀 veggies are often an after thought when it comes to roast dinners but not any more!